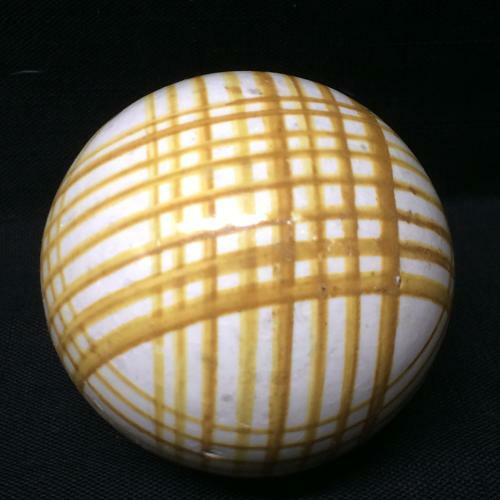 This is a genuine Victorian Carpet Ball or Carpet Bowl as they were known in Scotland. The medium sized ceramic ball measures approx. 3” in diameter, heavy duty solid glazed and decorated ironstone. The carpet balls were made around 1860 in Scotland or possibly Dawsons Low Ford Pottery in Sunderland , which also produced sponge and transfer printed carpets balls during the same period. There is no maker's mark. The condition is great with only some scuffing minor flakes and a few spots of wear and discoloration. The bumps and knocks are a sign of authenticity. A glorious example of the finest in English folk art to add to any collection of early sporting goods or early English ceramics.